This television special is an alternate telling of the Kamen Rider Ryukistory. Shinji Kidou's life, working as an employee at ORE Journal, takes a sharp turn after being pulled into the Mirror World by a Mispider. Luckily, he was saved by a Kamen Rider, Ryuki (Koichi Sakakibara, portrayed by Keiichi Wada). However, Sakakibara could no longer go on due to the severity of his injuries and passed his Card Deck to Shinji, allowing him to become the next Ryuki and defeat the monster. After meeting with Yui Kanzaki and Ren Akiyama (Kamen Rider Knight), Shinji learns about the conditions of the Rider War, as well as of the other Riders participating. Unable to allow such a game of death to exist like his Rider predecessor, Shinji sets out to convince all the Riders to end the senseless fighting and put an end to the War. His pleas fall upon deaf ears as just about every other Rider (except for the already-defeated Riders Raia and Scissors) sets out to hunt down Shinji and his eventual reluctant ally, Ren. Eventually, Shinji's deck is destroyed and Ren is critically injured, passing on the deck for Kamen Rider Knight to Shinji. 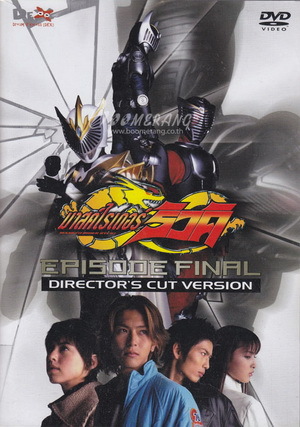 The special has two different endings which were voted on by the viewers via phone at the time of the initial airing: the voted-for-air ending (in which Shinji faces the surviving Riders on his own) and the alternate ending (a resetting of the Rider War). Kamen Rider | Tokusatsu | Anime | Tokurider 2011. Diberdayakan oleh Blogger.